In honor of Girl Day, a recognized day of Engineers Week, I had the pleasure of speaking to three Hoyle, Tanner engineers about their careers: Karen J. Frink, P.E. ; Audrey G. Beaulac, P.E., CPSWQ; and Jillian A. Semprini, P.E. While Engineers Week is a time to celebrate the industry and engage in topics such as engineering education and awareness, Girl Day is specifically geared toward introducing the industry to females, who tend to be underrepresented in this fascinating and essential field. 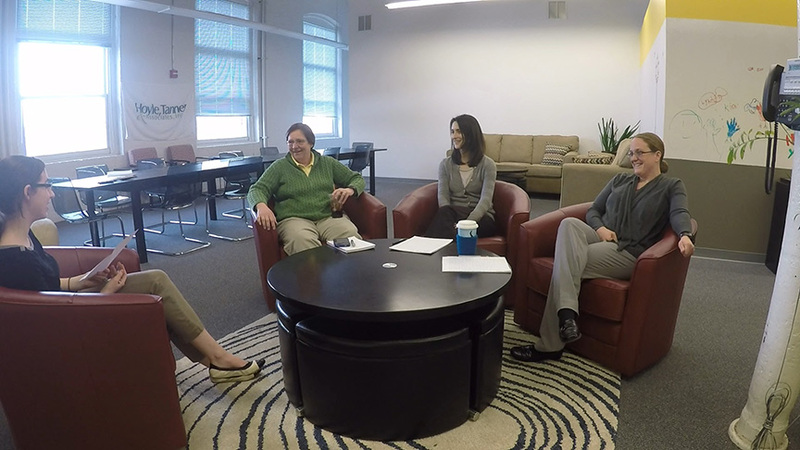 Karen, Audrey, and Jillian brought up a lot of interesting topics in the discussion, finding that they had quite a few things in common besides their place of employment. Despite working in different fields of engineering (aviation, bridges, and transportation, respectively), all three women did not always know that engineering was the industry for them. “I started out as a music major,” explained Karen, “and then took some math classes, and said, ‘Oh, I kinda like this.’” After studying abroad in England, she decided to come back to the United States and pursue a degree in engineering. While Karen went from music to engineering, Jillian enrolled as undeclared for her first year of college, while Audrey simply followed her passion for math and science until she definitely knew that engineering was where she belonged, around her sophomore/junior year of college. All three ended up as Hoyle, Tanner engineers, adding their expertise to the firm and to the industry as a whole. Because the number of women in engineering is not particularly high, Girl Day’s purpose is to introduce young girls to the industry and encourage them to learn more about engineering. This can be done in many ways, from engineering firms hosting events to engineers visiting schools as role models for girls to follow, which will hopefully aid in boosting the number of female engineers in the future. When asked whether they were ever discouraged to enter the field, Karen responded, “I don’t think anybody ever told me I couldn’t do it, but I’m not sure I remember anybody saying ‘Wow, you really can do this.’” Because engineering is not an easy field by any means, requiring extensive knowledge while balancing the responsibility of public safety, young people need the encouragement and confidence to enter the industry. Girl Day contributes to that empowerment, especially since there are so few women in the field. “I don’t think it’s well represented by women; I think they’re discouraged by it…they don’t get the mentoring they need,” explained Karen when asked about the lack of women in engineering. Both Audrey and Jillian explained that engineering was not very prominent at their high schools either, with Jillian saying, “Going through high school, I had no idea engineering was really even an option.” She was one of three females in her graduating engineering class of 2007. Fortunately, Girl Day will encourage girls to study engineering, but it will also help increase the success of engineering projects due to the diversity of minds at work. Karen touched upon the benefits of both men and women collaborating in the industry, explaining how the multi-tasking talents of women complement the more one-task-at-a-time nature of some of the males. Not only does the field of engineering benefit from these diverse minds, but it also benefits from diverse skillsets. While engineering is frequently labelled as a strictly STEM field, all three women agree that a creative skill set comes in handy as well. Audrey explained that with engineering, “There’s general guidelines to follow, but not every project is the same.” She credits thinking outside the box in order to ensure all projects meet the standard criteria. Engineering may foster a sense of creativity as well as math and science, but unfortunately, it does not receive the public promotion that it deserves, as Karen pointed out: “Even to men, it’s not well-promoted….we’re gonna run out of engineers at some point, because nobody’s majoring in it anymore.” Although I am not an engineer, I even recall that the field was not heavily promoted when I was in school. I can remember various courses and academic clubs on topics such as law and healthcare, but not so much engineering. Hopefully, Engineers Week will boost the confidence of both men and women and draw attention to the importance of skilled engineers in today’s society. When asked what advice she would give to young people, particularly girls, wishing to enter the field of engineering, Audrey responded, “Just don’t let anyone tell you can’t. If you’re truly interested in it, just go for it.” Hopefully, more people will take Audrey’s advice and contribute their skills to the future of engineering.